HAVERFORD TWP., Pa. (WPVI) -- Police are looking for possible witnesses to a weekend murder in Haverford Township, Delaware County. 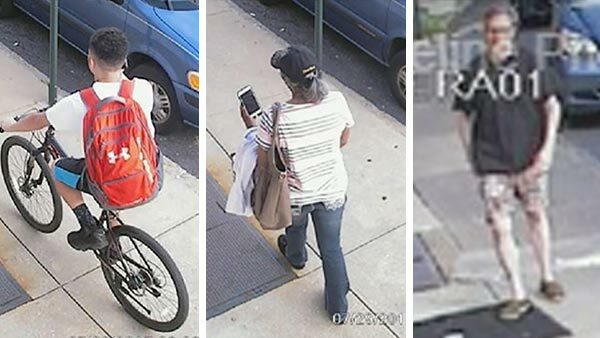 Investigators released photos of three potential witnesses on Wednesday afternoon and are asking them to come forward. This comes as police continue to seek the accused killer, 24-year-old Derrick Rollins. Police ID suspect wanted for Haverford Twp. killing. Annie McCormick reports during Action News at 11 p.m. on August 1, 2017. He is accused of killing 29-year-old John Le around 6 p.m. Saturday at an apartment complex in the 2300 block of Haverford Road. The killing came a short time after Rollins allegedly opened fire on two men who had been tracking him down after they saw him peering in a window in the Overbrook Park section of Philadelphia, police said. Anyone with information is asked to contact the Haverford Township Police Department Detective Division at 610-853-1298 ext 1235, Attn Det. Long or email TLong@havpd.org.